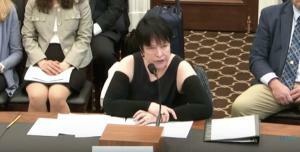 WASHINGTON, DC, USA, April 10, 2019 /EINPresswire.com/ — Yesterday, LE&RN Spokesperson Kathy Bates was a public witness before the House Appropriations Subcommittee on Labor, Health and Human Services, Education, and Related Agencies. This testimony had been requested by Rep. Rosa DeLauro (CT), House Committee on Appropriations, Chair, when the two met during LE&RN Lobby Days in March. • expand access to compression garments by requesting passage of the Lymphedema Treatment Act this year. Although this Committee does not deal with insurance issues, we believe it was important to concurrently make the case for the passage of the LTA. Ms. Bates was accompanied by LE activists Kelly Bell and Lindsay Bennett, and brought Youth Ambassador Emma Detlefsen's moving words to the floor of Congress. LE&RN thanks Representatives Rosa DeLauro, Barbara Lee, and Tom Cole for their attention and thoughtful remarks. Video of the testimony is available on LE&RN's YouTube channel. Next Next post: Waggoner Diagnostics Releases TestingColorVision.com, a validated, online color vision test solution.